The “road from nowhere” is a household term among Restonians who are abreast of the day-to-day happenings in local development and land use. The conceptual road, which runs from the Isaac Newton Square property to American Dream Way, cuts straight through an open space resource that local grassroots groups are trying to protect from development: Hidden Creek Country Club. There are no plans on the books to build the road. But the presence of the line in Reston’s Comprehensive Plan has some scratching there heads: Where did this road come from? And what does it mean for the golf course? Geiger stressed the road has not been designed and if it is — whether through private development or through a public project — the community will have multiple opportunities to provide their feedback. The county will also work through the potential impacts to the golf course or environmentally-sensitive land in the area. No development applications have been submitted for the Isaac Newton property to date. In May 2016, however, an application to develop a nearby three-acre site at 11480 Sunset Hills Road into an apartment building was indefinitely deferred. 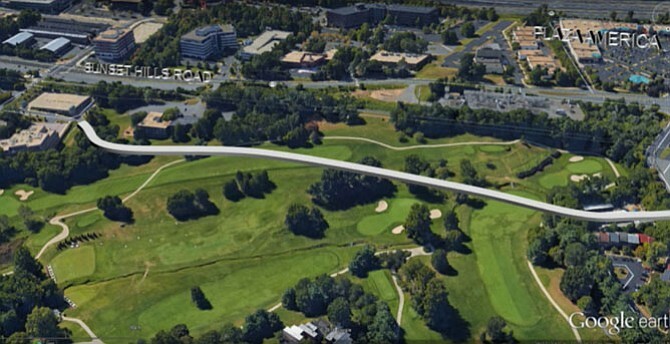 But grassroots groups like Rescue Reston, which actively led efforts to stop the redevelopment of Reston National Golf Course and pledge to do the same for Hidden Creek Country Club, want the planned road connection removed from the comprehensive plan’s map. Its presence suggests the disruption of the golf course, which is one of two in Reston that the plan intends to protect. In February, then-Reston Association CEO Cate Fulkerson requested that the county remove the line from the Reston Master Plan. Similar requests from community members surfaced again in recent workgroup sessions with county officials this month. But county staff have remained reluctant to remove the road, noting that the conceptual road shows the intention of connecting the grid of streets with American Dream Way. Despite assurances, some concerns remain, especially as Wheelock Communities engages with community stakeholders to determine the future of the golf course. No redevelopment plans have been formally proposed yet.